Almighty God, bless our nation and make it true to the ideas of freedom and justice and brotherhood for all who make it great. Bless our land with honourable industry, sound learning, and pure manners. Save us from violence, discord, and confusion; from pride and arrogancy, and from every evil way. And most especially guide us in choosing the right Presidential candidate to vote in the next election. 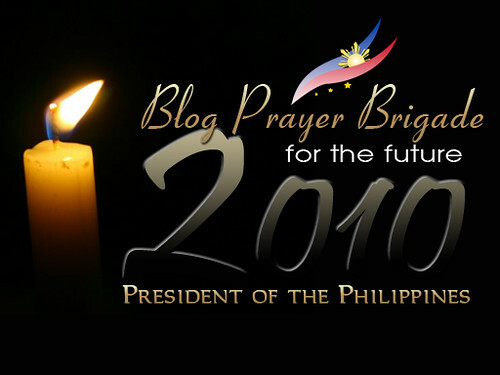 I, Iris Camille Mejia-Acosta, support the cause of the Blog Prayer Brigade for the election of the Future President of the Republic of the Philippines and I do solemnly promise to recite the prayer, which I wrote, in my own convenient time and regularly as possible until the 2010 Presidential Election commences. Let it be written, let it be done. I, _____________________(name) support the cause of the Blog Prayer Brigade for the election of the Future President of the Republic of the Philippines and I do solemnly promise to recite the prayer, which I wrote, in my own convenient time and regularly as possible until the 2010 Presidential Election commences. Let it be written, let it be done. I really hope our country will change for the better. Anyway, I have to go. I need to check some promotional products for Christmas giveaways.